When you’re writing about a game everyone has already heard of, there’s a certain peace that washes over your mind. Do I need to explain who Mario is? No. Do I need to go into detail about his relationship with Princess Peach and Bowser? No. Need I point out that Mario jumps a lot? Of course not. Super Mario is one of those rare video game franchises that is so broad and well known, that I don’t need to explain the characters or premise to anyone, regardless of whether they play video games or not. Though it does beg one question; how do I fill a word count? New Super Mario Bros. U Deluxe is jumping onto the Nintendo Switch very soon, offering players a smoother, though incredibly familiar experience to what they’ve seen before. This isn’t an original game, this is a complete port of the New Super Mario Bros. title we saw on the Wii U – as evidenced by the U lingering in the title like a bad smell. But this is the Deluxe version of course, and it does improve on the original in a few minor ways. First off, this game looks much smoother. A crisp 1080p image on the TV and native resolution when handheld, in addition to some slightly sharper updated textures. It all helps stages and the overworld pop and feel alive, though it’s certainly a minor upgrade. A bigger addition is Toadette as a playable character, and the Super Crown, which you may already know of thanks to the internet’s fascination with the hypothetical – and definitely not in the game, thanks – Bowsette. Using the Super Crown, Toadette – and only Toadette – can transform into Princess Toadstool, and use her classic hovering abilities to move through the game. Yes, it definitely introduces some massive lore-shattering questions to the world of Mario, but let’s ignore that for now. 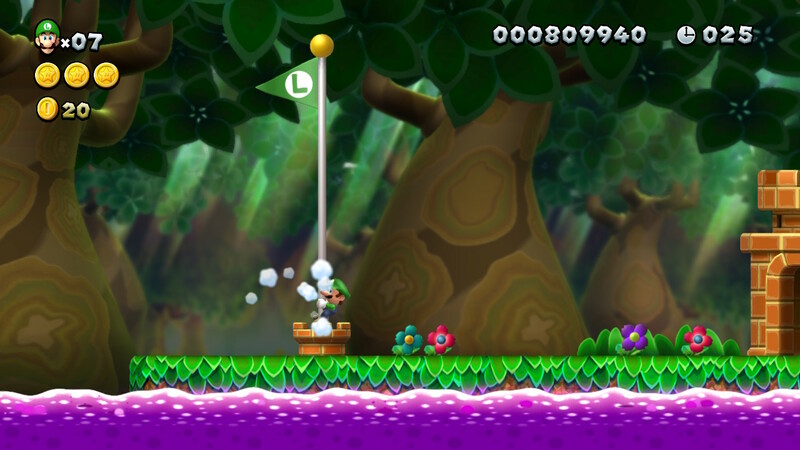 Toadette represents a new “Easy” mode, along with Nabbit’s Very Easy mode. 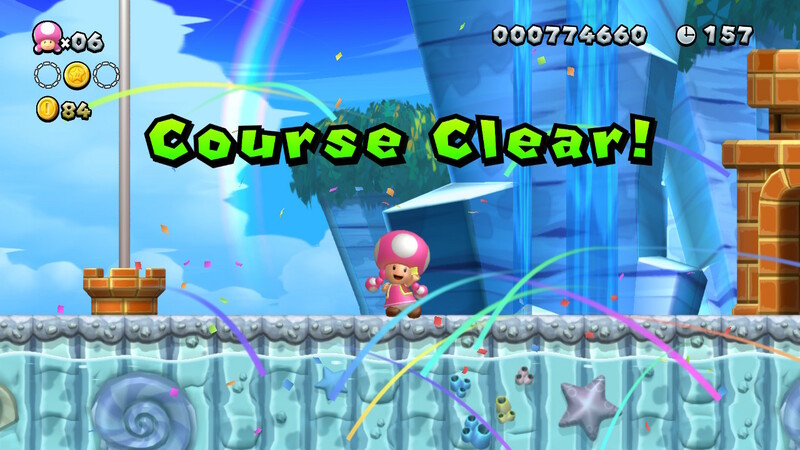 Toadette, using the Super Crown, can float over many obstacles and dangers quite simply, while Nabbit can only be killed by being crushed or bottomless pits. These two character options are here to give less experienced players a way to play through the game with little issue, though in multiplayer it causes issues. Four player simultaneous multiplayer is great, but it’ll force someone to play as either Toadette or Nabbit, regardless of whether they want to or not. On top of that, playing as Toadette will mean item blocks will always give out a Super Crown, removing a potentially more useful item. Nabbit is worse though, who’ll simply hoover up items for points, removing them from play entirely for the other players. A great way to play for less experienced players, but as usual, it’ll just make multiplayer more frustrating than ever. Toadette has a single mechanical advantage over the other players though, surprisingly – when underwater, Toadette has entirely separate swimming mechanics. And shockingly, these mechanics actually make it preferable to use an analogue stick. Yep, Toadette swims in any direction, a full 360 degrees. Other characters just mash jump to get slightly more height when underwater, but this is totally different, slightly inspired by the newer Donkey Kong Country games. It works incredibly well, although does somewhat trivialise underwater stages. But even players that bought a Wii U and New Super Mario Bros. U might’ve missed out on some of the stages included in this Deluxe package, as this includes New Super Luigi U. 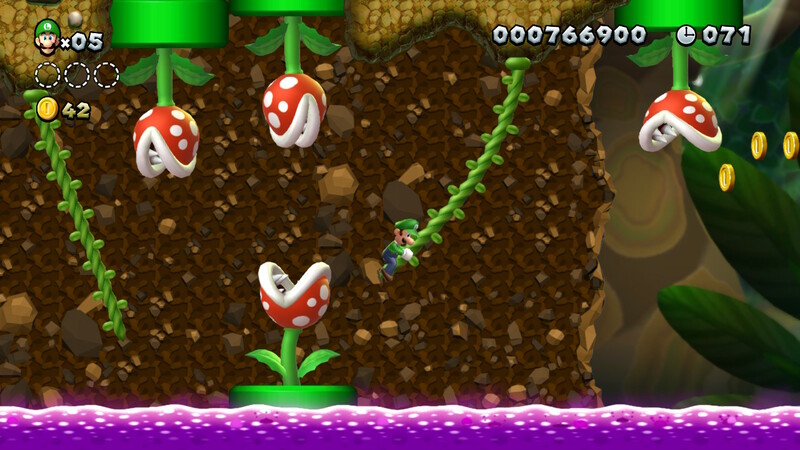 New Super Luigi U was a DLC/standalone package which innovated and changed many of the stages in New Super Mario Bros. U, essentially giving players an entire second campaign to play, and it’s much more challenging. Completely remixed stages with a much higher skill requirement than usual make New Super Luigi U a breath of fresh air for experienced Mario players; combined with the stages from New Super Mario Bros. U, it makes this one of the most robust and interesting Mario platformers ever. It really can’t be understated – New Super Luigi U adds a lot of content to this package, almost making it worthwhile for players who played New Super Mario Bros. U to double dip. I know what you’re thinking about. The JoyCon. I know. No D-pad. Yeah, I prefer a D-pad with my Mario games, definitely, and the Pro Controller is there for me when I need it, but playing in handheld mode has been surprisingly good, even with the separated four-button D-pad layout. It takes a stage or two to adjust to, but after a short while the D-pad on the JoyCon honestly felt fine to play with – still preferable to using an analogue stick, personally. So let’s recap. Loads of good content, new characters, new items, multiplayer shenanigans – it seems like this is a pretty fantastic Mario package. Though, of course, if you played both or either or the two Mario titles in this package, the value proposition for you will be much, much lower. If you’ve played both games already, this isn’t worth picking up for Toadette, unless you’re a truly massive New Super Mario Bros. fan. But this is pretty much the pinnacle of Mario platforming. It’s challenging and fun and has characters to suit all playstyles – it’s honestly really great, and the only way you could get a better package for your money is if Nintendo launched Super Mario Maker on Switch. Even then, the stages you’ll find in this game are more original and creative than those you’ll be able to create by yourself.